This budget hotel is located across the street from the Gulf of Aqaba, a 5-minute walk from central Dahab. It includes a shaded lounge area in the garden and a 24-hour reception. 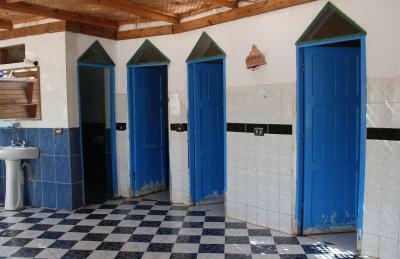 All air-conditioned rooms at The Bishbishi Garden come with wooden furniture and a private bathroom. Most of them have a free Wi-Fi connection as well. Bishbishi’s à la carte restaurant serves breakfast, lunch and dinner indoors or on the palm-lined terrace. Guest can also find a number of local restaurants a 2-minute walk away. 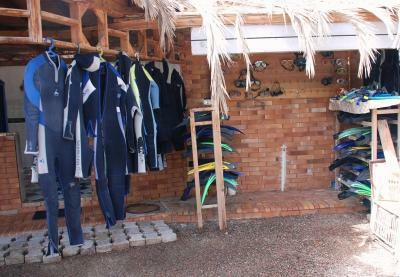 A diving center is located a 5-minute walk away, and snorkeling equipment can be rented on site. The hotel also offers a laundry service, travel desk and luggage storage room. Airport shuttles can be arranged from any of Egypt's international airports, including Sharm el-Sheikh Airport, 36 mi away. Free parking is provided. This is our guests' favorite part of Dahab, according to independent reviews. 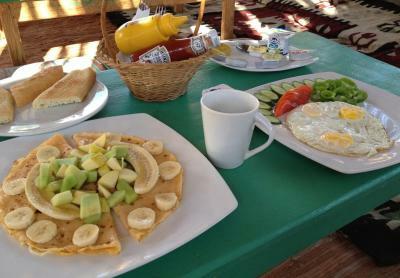 뀐 Located in the top-rated area in Dahab, this property has an excellent location score of 8.0! When would you like to stay at Bishbishi Garden Village? Air-conditioned room with wooden furniture, a wardrobe and a private bathroom. House Rules Bishbishi Garden Village takes special requests – add in the next step! Hotel staff were super chill. They provided us with everything we needed. Nice little spot for the seasoned traveler or backpacker. Staff organized snorkeling trips, Mt Sinai package and diving trips for us cheaper than the area travel shops. Great location with lots of shopping and restaurants close by as well as finding some good goodies. Nice little hippie joint to stay in. I would definitely go back again. Oula, the manager is great. The property is run down, everything is shabby but manages to work eg. the toilet flushes, the a/c unit puts out cold air, even though it sounds like it’s going to explode, the refrigerator gets cold. It was similar to indoor camping! On the upside, though, was the way we were treated - from our side trips to the transportation back to the airport in Sharm. The hotel needs more clients so money can be generated to fund improvements.